Dennis McCarron By 23 w w w . M o d e r n T i r e D e a l e r . c o m T he average mid-sized single independent repair shop services about 10,000-12,000 retail customers a year. ey do this nobly. ey do this generally without incident. Sure, there can be disagreements and miscommuni- cation at times, but since most small businesses are built on reputation, owners must usually be significantly generous in their attempts to resolve conflicts with customers. Truth be told, in my 25 years of experience, it's the customer who is usually wrong (I like to call it "passionately misinformed"), but if you want to stay in business, it's the owner and the employees who need to resolve the difference between facts and truth. However, that's not to say there aren't bad actors in the retail tire business. Very few are downright morally ambiguous. A handful just lack decency. And some don't know better. ese are the players who give us all a bad name. I want to share with you something I see several times every year. It's called "Sweeps Week." Every year in the months of November, February, May and July, television stations collect data from viewers that they use to set their rates for commercials and other promotions. ese are the months where the networks really try to juice up a show's content. One of their favorite targets is the automotive repair industry. In the month prior to Sweeps Weeks (October, January, April and June), you can expect an uptick in "undercover" or "sting" news segments, "gotcha" nightly news reports, and other methods. 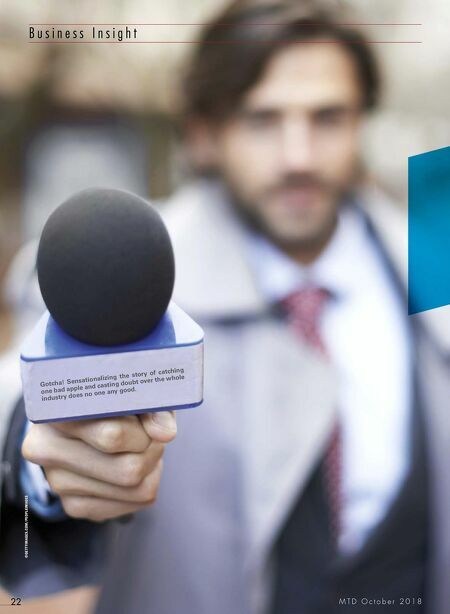 Here's what the TV networks are looking for. Fraud. ey primarily want to catch a sales- person selling something that isn't "needed" or selling something that isn't performed. Some stations legitimately put a marker on a filter to see if it gets replaced. Some stations get a pre-inspection to establish a baseline. Some stations get a little more morally blurry and stage a symptom, hoping to trap a business in a poor diagnosis. In every instance, it is always up to the business to make sure that work sold is legitimate and performed. Never use the word "needed." It is misleading to customers. Since the conversation between a salesperson and customer is unbalanced (the salesperson holds the majority of power and knowledge), the word "needed" can be seen as manipulative. Does it mean safety? Does it mean convenience? Does it have a meaning of time frame? It's a bad word for the industry. Get rid of that word from your shop. Ban it. Start a curse jar, $5 for anyone who says the word "needed." 'YOUR EMPLOYEES NEED TO KNOW WHAT IT FEELS LIKE TO BE PUT ON THE SPOT IN FRONT OF A CAMERA, AND HOW TO REACT.' 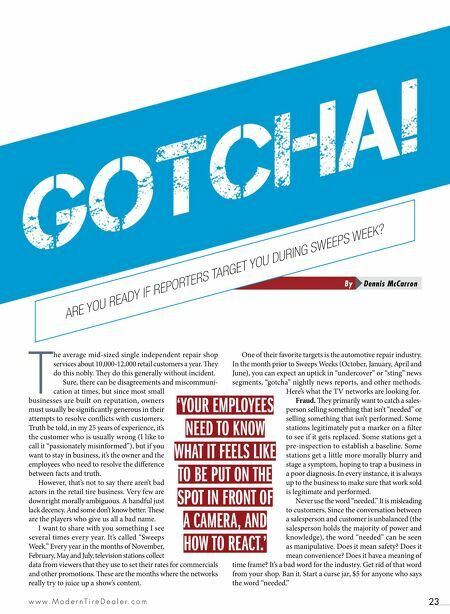 ARE YOU READY IF REPORTERS TARGET YOU DURING SWEEPS WEEK?